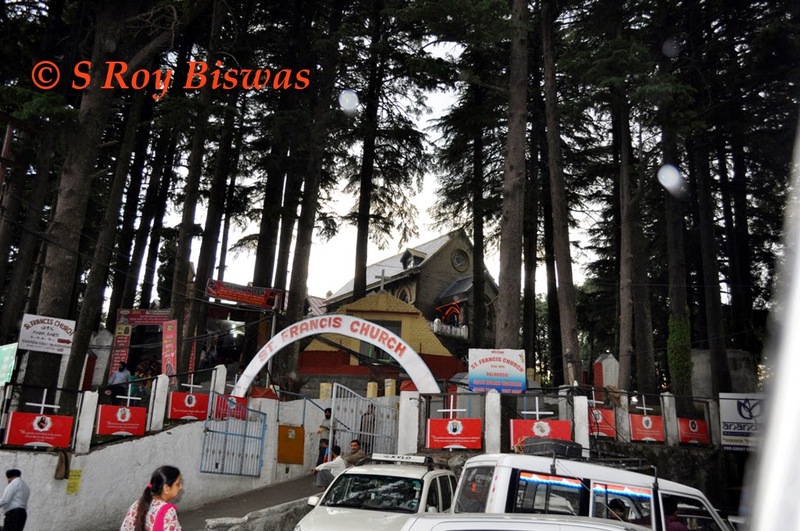 Having visited Chowari Jot, we traversed back upto Gete village and here from we took the diversion towards Khajjiar. 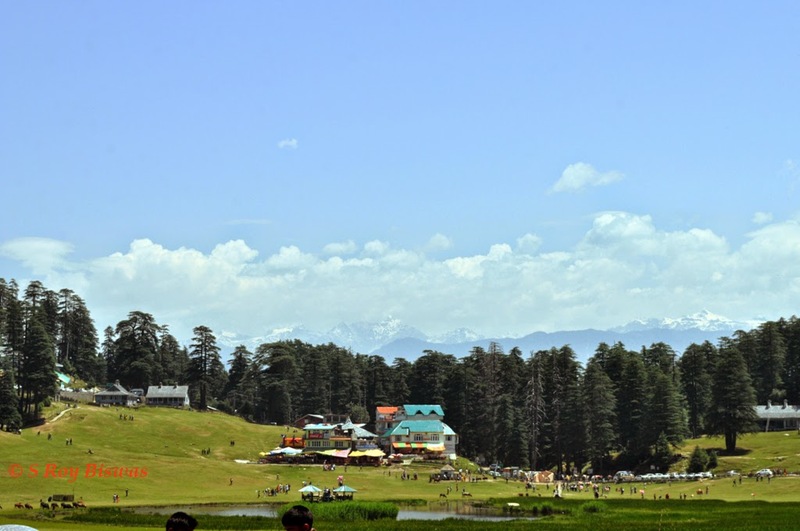 Khajjiar is at a distance of about 10 Kms. from Gete and about 37 Kms. from Chamba. As we had started early in the morning from Chamba, we were able to reach Khajjiar by 10.30 A.M. in the morning and the tourist rush had not built up by this time. Therefore, we had a little breathing space, though we too were pestered by the local Poni wallahs et al. 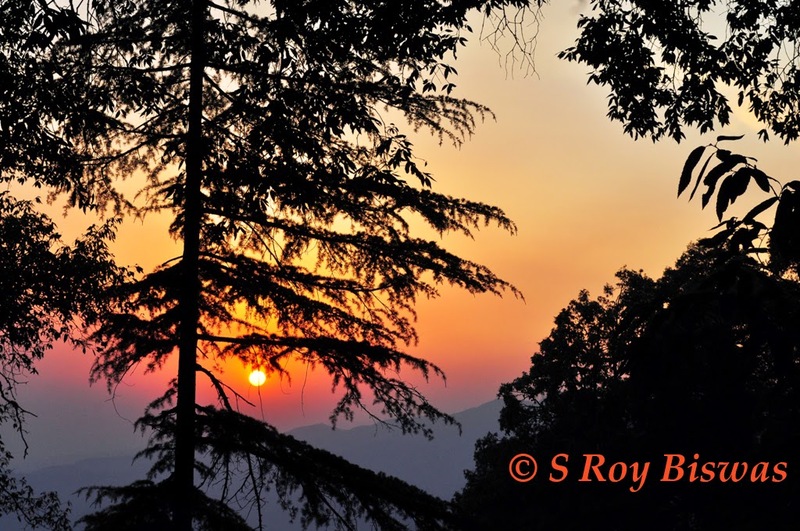 Khajjiar is a beautiful destination, but the over exploitation of the place for commercial use is slowly having its affect on its ecological balance and if not checked in time, it shall be an irreversible action. 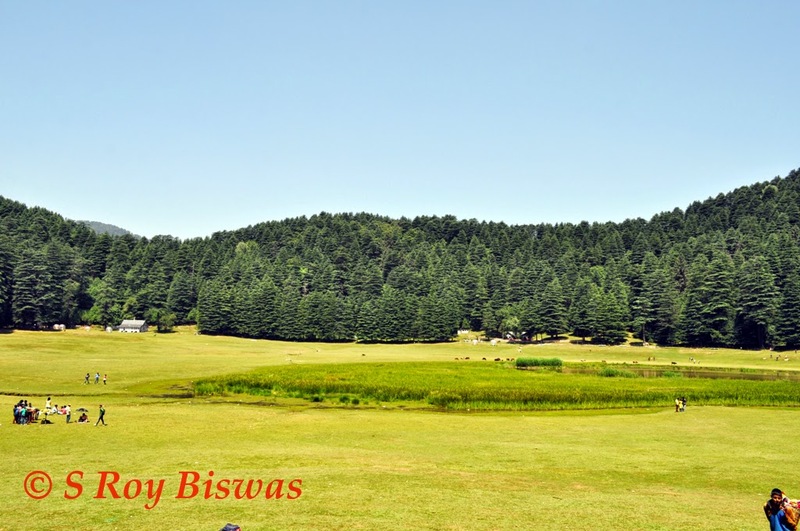 Khajjiar at a first glance appears as a saucer shaped meadow, with a pleasing view of green grass, with a backdrop of Deodar trees and blue sky from one side and the backdrop of the Dhauladhar Ranges from the other side of the meadow. There is said to be a small lake in the middle of the meadow, but it was non-existent when we visited. Khajjiar is perched at an altitude of 6400 feet above sea level, thus, enjoys a salubrious climate all year round, except for the few winter months, when snowfall blocks the way to this destination. The picturesque backdrop of the place has earned it the epitaph of being the ‘Switzerland of India’. Apart from a plethora of vendors selling all kinds of wares & food items, there is a group of locals who carry alongwith them a wicker basket containing artificial flowers and a pair of Rabbits, offering them to the visitors to photograph with @ Rs.10/- per shot per person. My wife & daughter too participated in this ritual and had their photographs clicked by me. However, the kids were most thrilled when they found that the adventure sport of ‘Zorbing’, rolling down inside a inflated transparent plastic ball, which was first tried in Russia in 1970s, but introduced as a regular sport in New Zealand in 1994 (from Wikipedia) was being offered in Khajjiar. The rates for a 10 minute ride, including time to mount and dismount @ Rs.150/- per person, with two persons boarding one Zorbing ball at one time, is reasonable, looking at the kind of thrill it provides to the kids. 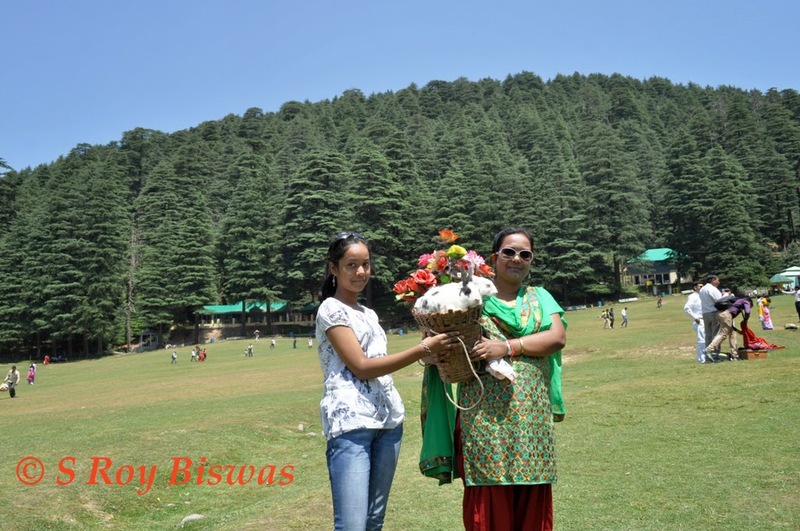 Having spent some quality time at Khajjiar, we headed towards Dalhousie. The road from Khajjiar to Dalhousie is through a narrow road, with points where it is difficult for two vehicles to pass each other and ascends all the way upto Lakkar Mandi. The distance from Khajjiar to Dalhousie is 29 Kms., but it took more than a hour for us to reach Dalhousie, as the rush from Dalhousie towards Khajjiar had started at the right earnest. There were foolhardy drivers from places like Haryana, who had driven in their own vehicles and were afraid to drive their cars to the sides for allowing the other cars to pass by, thereby causing a minor jam on the road. When the other drivers started shouting at them, they said in their local dialect – “Daar laage hai”, meaning that we are feeling afraid. This is one of the numerous examples of types of drivers who drive into the hills, without knowing the basics of hill driving. We ascended for about 18 Kms. 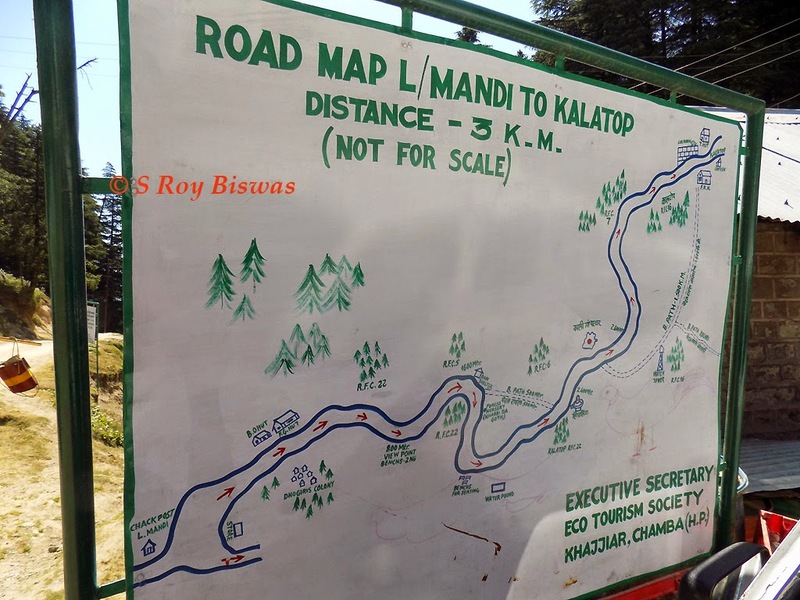 till be reached the trifurcation of the road at Lakkar Mandi, wherefrom one road comes in from Khajjiar and the other two lead to Kalatop Sanctuary and Dian Kund respectively. Thereafter, the road descends for another 11 Kms. up to Dalhousie, till one reaches Gandhi Chowk. 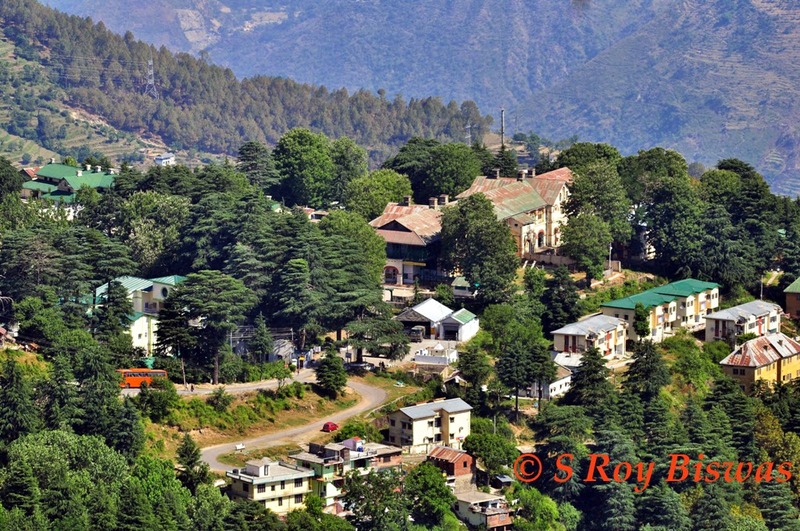 Dalhousie as is its name indicates has been named after its founder, the then Viceroy Lord Dalhousie. Perched at an altitude of 2039 meters in the outer slopes of Dhauladhar range, with the backdrop of its natural beauty and quiet surroundings, it is one of the beautiful hill towns of Himachal Pradesh. 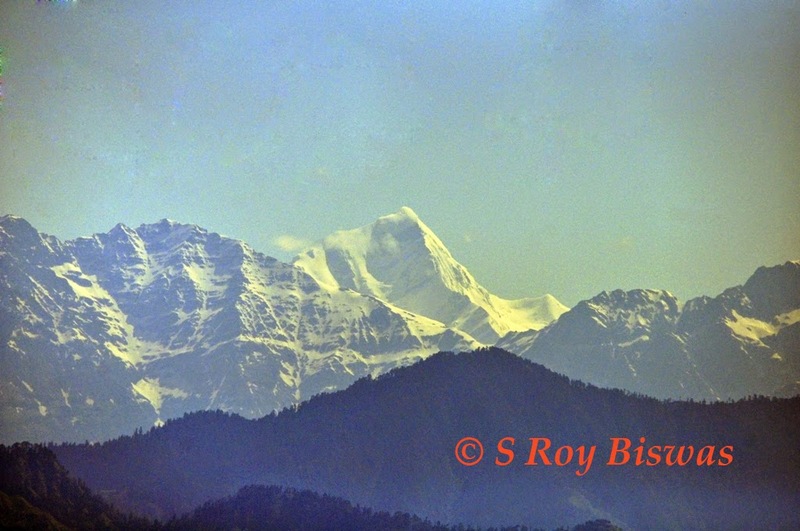 It comprises of five Hills namely Balun, Kathlog, Potreyn, Tehra and Bakrota with heights ranging between 1525 mts. to 2378 meters. It has many level and interesting walks amongst dense forests. 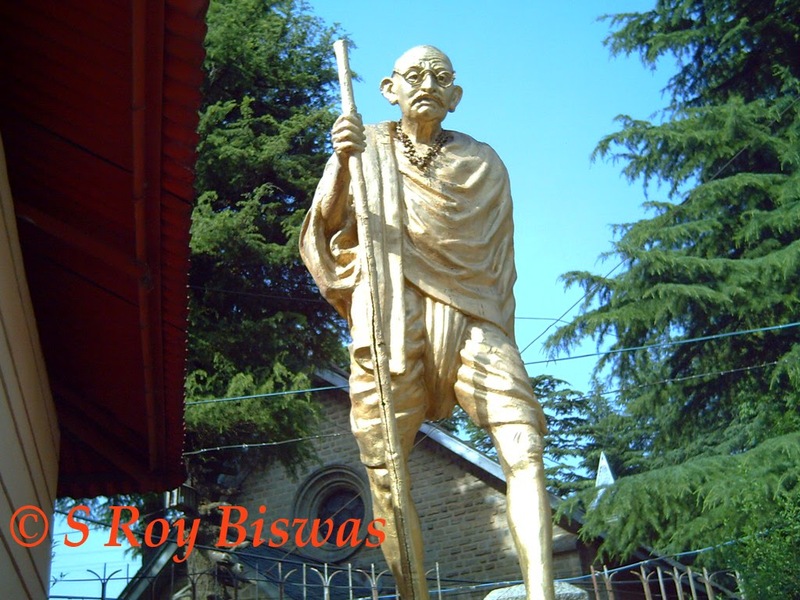 Two major points in Dalhousie are the Gandhi Chowk and Subhash Chowk, which are within walking distance of each other. 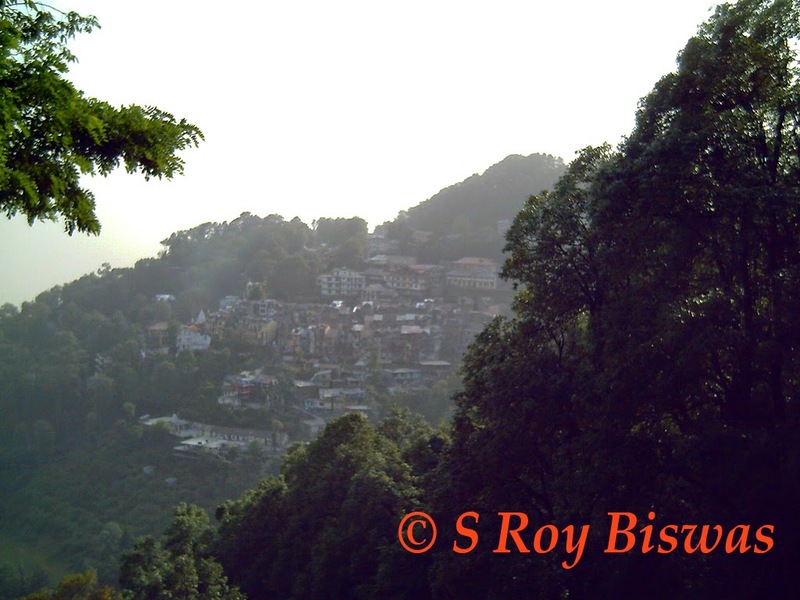 Dalhousie is a place for walking, as there are numerous trekking routes within the town itself. The roads have been designated to be one way; however, the locals flout it with impunity. 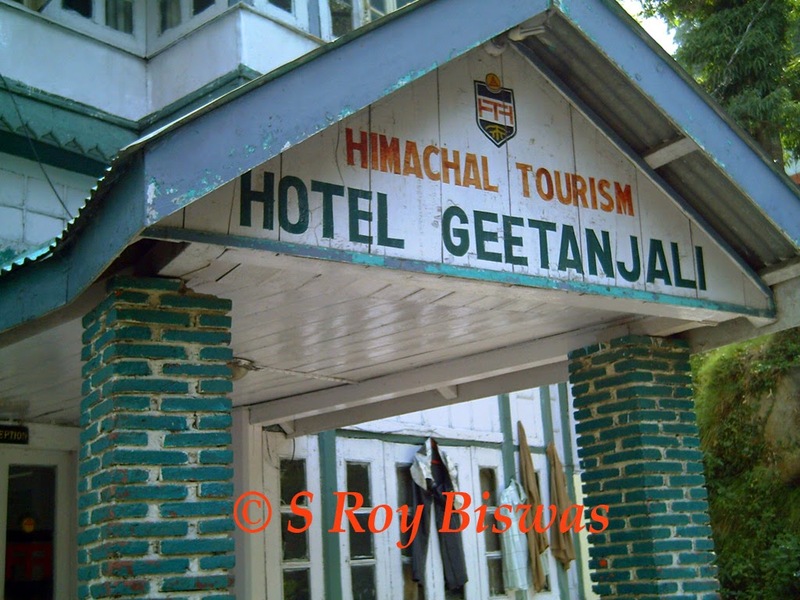 We headed for hotel Geetanjali, which is located on the road from Gandhi Chowk to Subhash Chowk. However, the hotel did not have the facility on parking the vehicle and is housed in an archaic old building and room allocated to us reminded me of my residence, a British era bungalow in Kasauli, where I had spent my childhood. Having checked into the Hotel at around 3.00 P.M. we proceeded to take a short break and decided take a short tour of township later in the evening. However, I had a bout of nausea while coming from Khajjiar alongwith my daughter and I had assumed that it was because of the morning B’fast. However, the bouts continued intermittently and finally I had to take some medicine to get some relief. It was my daughter who pointed out to the right reason for our sudden illness, as the two of us had partaken ‘Nimbu Soda’ (a kind of local soft drink with the bottle having a marble, pressed up due to pressure of Carbon dioxide present, on its neck) at the Chowgan in Chamba, the previous evening and despite instructing the seller not to put ice in the drink, he had proceeded with it. Sensing that we had contacted some sort of water borne infection, I immediately took some anti-biotics and that did the trick for us. Being a wee bit tired and in the salubrious & cool environs of Dalhousie, all of us fell asleep, only to be woken up by noise being generated by howling winds outside. I stepped outside and found that the weather a taken a turn for the better ?? (in such circumstances) and the bright sunshine and heat of the day had given way to cloudy skies and strong winds and it started raining also, albeit only light showers to start with intermittently. We ordered Coffee and Pakoras to enjoy the weather to its hilt. As it appeared that the weather had improved a wee bit, we started for a short tour of the Dalhousie town. We had hardly gone about 100-150 meters from the Hotel, that it started raining again and luckily for us the vehicle was parked nearby and we boarded it in a hurry. After waiting for a few minutes, as we could feel that the weather was again improving, we moved in towards Subhash Chown and as it was still raining we decided to go upto Gandhi Chowk instead, hoping that the weather would improve by then. Being designated as an one way traffic, we drove down to the Bus stand and therefrom again headed upwards for Gandhi Chowk. Being Friday evening, hordes to tourists had started arriving in Dalhousie, even in big buses, causing traffic jams all along the road. However, as we reached Gandhi chowk after about 40 odd minutes, we found that it was raining heavily and therefore, we turned back towards Subhash Chowk. Now luck seemed to favour us and as we neared our hotel, the rains gave way to clear skies and after disembarking from the vehicle, we walked down to Subhash Chowk. 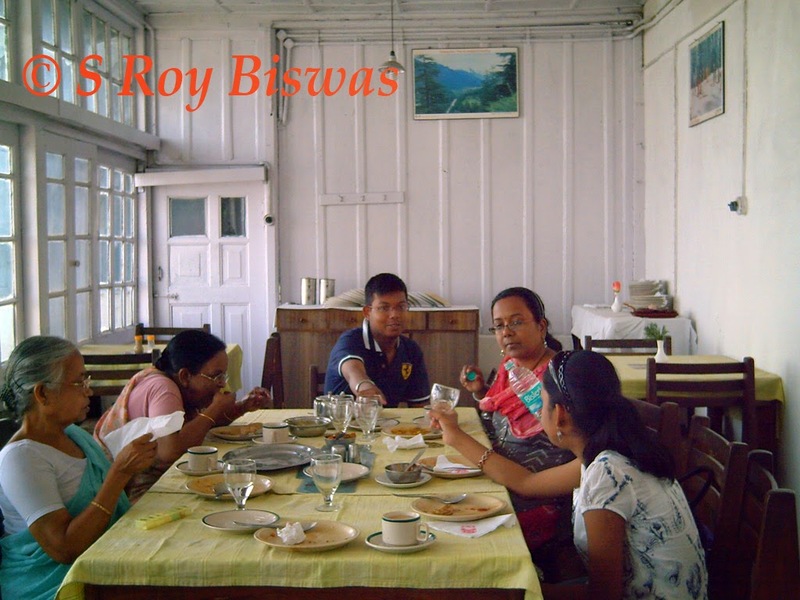 Having watched the Television serial ‘Chakh Le India – Kaache Raste’ anchor & host Mr. Aditya Bal savoring local Buns with boiled Chick peas, my wife wanted to taste it and except for me & my daughter, who were suffering from pangs of having tasted ‘Nimbu soda’ in Chamba, everyone else enjoyed the treat. They also tasted other delicacies like Momos etc. and cup of coffee from the shop nearby, whereas I had a cold drink with my daughter. Having enjoyed the views from Subhash Chowk and after witnessing the grand sun-set we proceeded back to the Hotel. After having freshly cooked and good food, I and my daughter had puffed rice that we were carrying, we retired for the night. Next day, my better half got up early in the morning, as she was apprehensive, as to whether I would be physically fit to embark upon the strenuous trek in the Kalatop Sanctuary as planned and having assured her about my fitness, after partaking a quick B’fast, we proceeded towards the Kalatop Sanctuary. The Sanctuary is perched atop the hill overlooking Dalhouse and one has to retrace one’s steps back up to Lakkar Mandi (literal meaning Wood trading place) at a distance of 11 Kms. 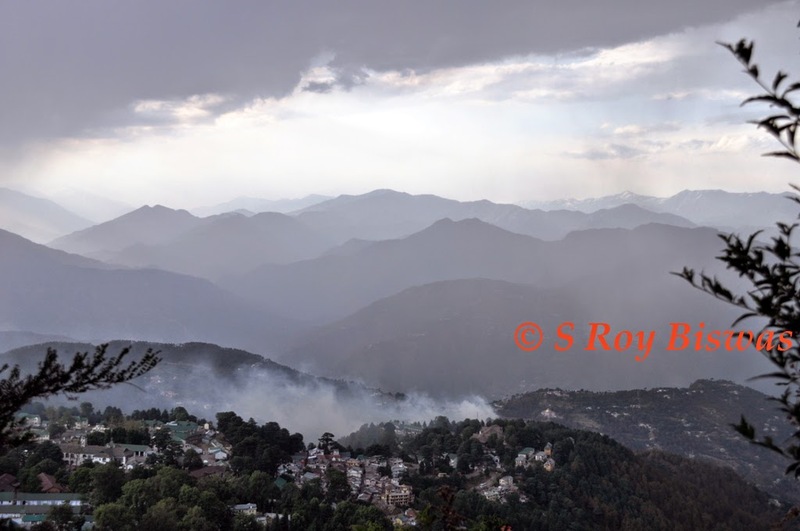 from Dalhousie. We reached the Sanctuary Gate, but we did not want to drive inside the Sanctuary area and hired a guide for Rs.400/- for facilitating a guided tour, on foot, inside the Sanctuary. 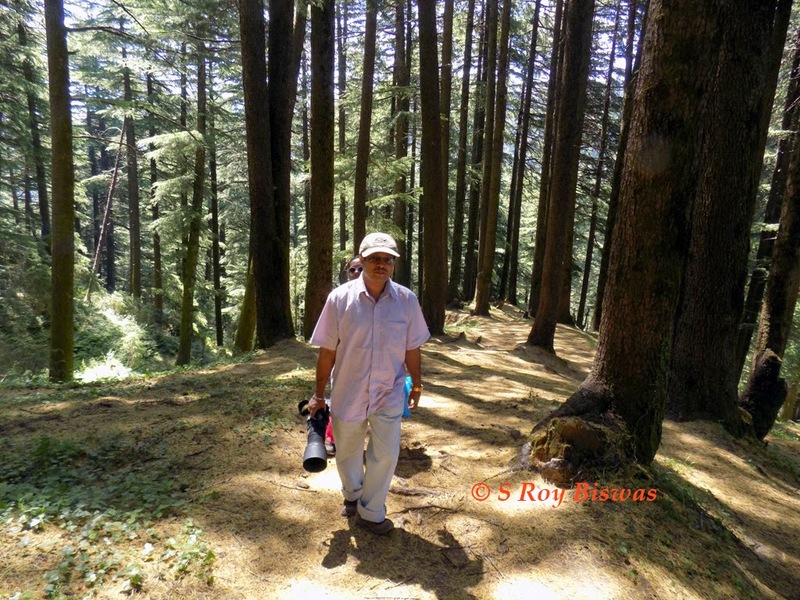 Initially the trek route gradually ascends upwards, meandering towards the top, passing amidst the Deodar trees and scattering of Daisies all around and whiffs of sweet fragrances floating in the air from the flowers and trees, some of whose leaves smell like Primrose. One can hear occasional chirping of birds high up on the forest canopy, but the sudden sound of vehicles roaring in towards the Forest Rest House scares them away. 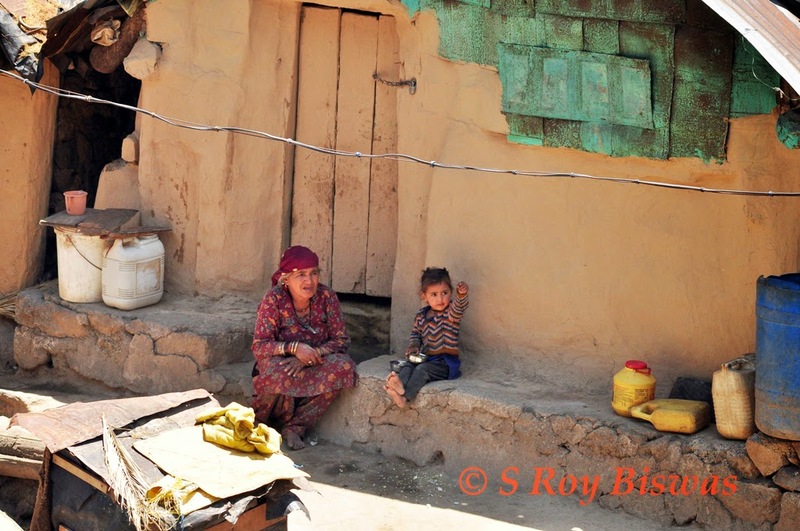 Inside the Sanctuary, we found Cattle grazing rampantly as well as the herders & their children making a cacophony of noises. 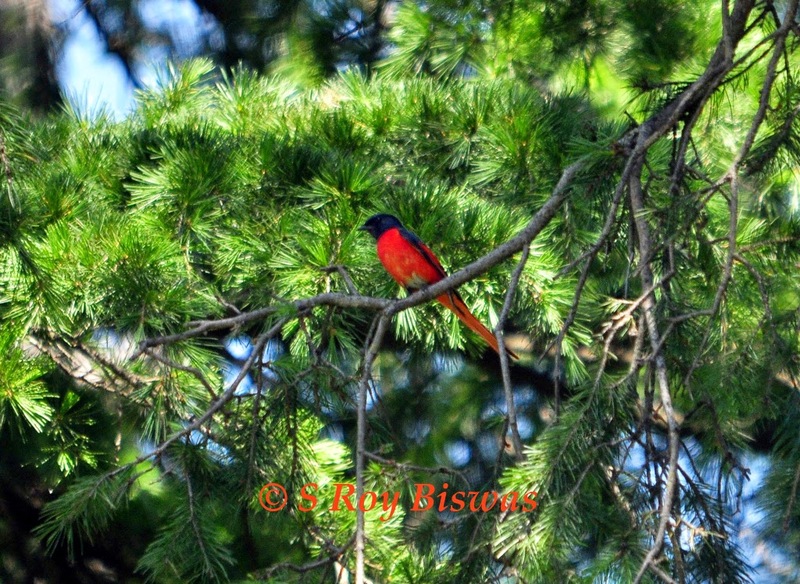 However, we were able to spot a few Minivets, Parrots and other smaller Warblers, but were unable to capture many in our Cameras, as they were higher up on the canopy. As most of the visitors do not trek through the forest, the guide too lost the way on our way back and he had to make some frantic efforts to find out the correct route and we in turn had to make way and descend through heavy undergrowth, which we negotiated skillfully. However, this debacle made us loose some precious time and the trek was almost 6 Kms., as against 4 Kms. as many sites had suggested, thus, by the time we reached back the hotel, it was almost 1.00 P.M. As we had promised to be back by 11.30 A.M, the old ladies were a harried lot, as the mobile phones had no connectivity inside the Sanctuary and thus, they had no idea about our whereabouts. We decided to have lunch immediately and move out of the hotel at around 4.00 P.M for visiting other destinations in Dalhousie. 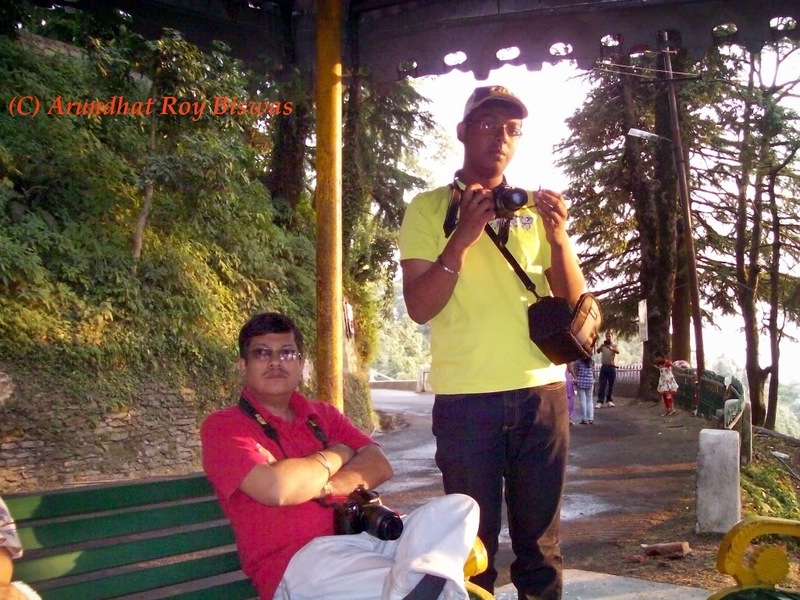 In the evening we started off for visiting the remaining destinations in Dalhousie. From Subhash Chowk we again retraced our way back to Gandhi Chowk and therefrom headed downwards towards the Panjpullah. On the way a sign board indicated ‘Satdhara falls’, we got down only to see a trickle of water coming down and were disappointed, as this placed paled in natural beauty as against the waterfall we had visited beyond Hadsar and others on way to Holi. 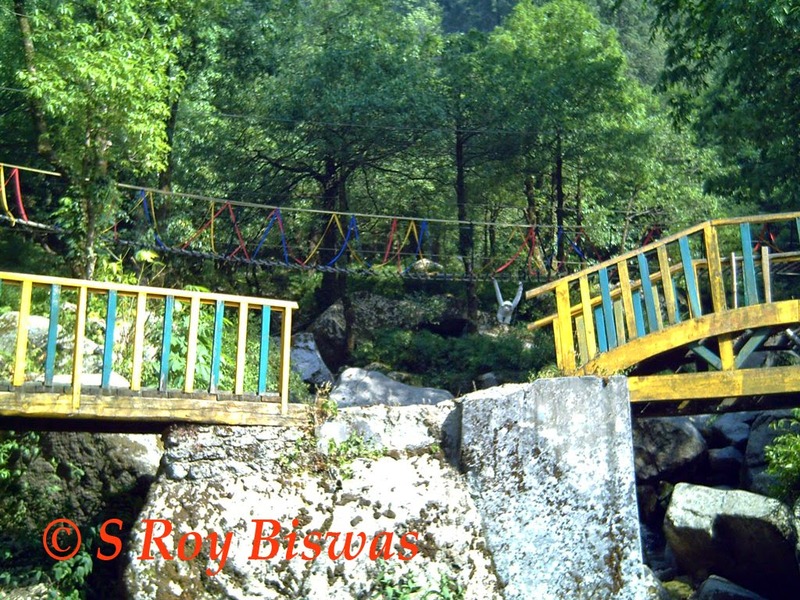 We continued with our journey, only to be more disappointed as ‘Panjpullah’ (literally meaning five bridges), which was a man made mockery with nature, with five colorful little bridges built across a dirty mountain rivulet??? The place was teeming with people and various eating joints and curio shops around. 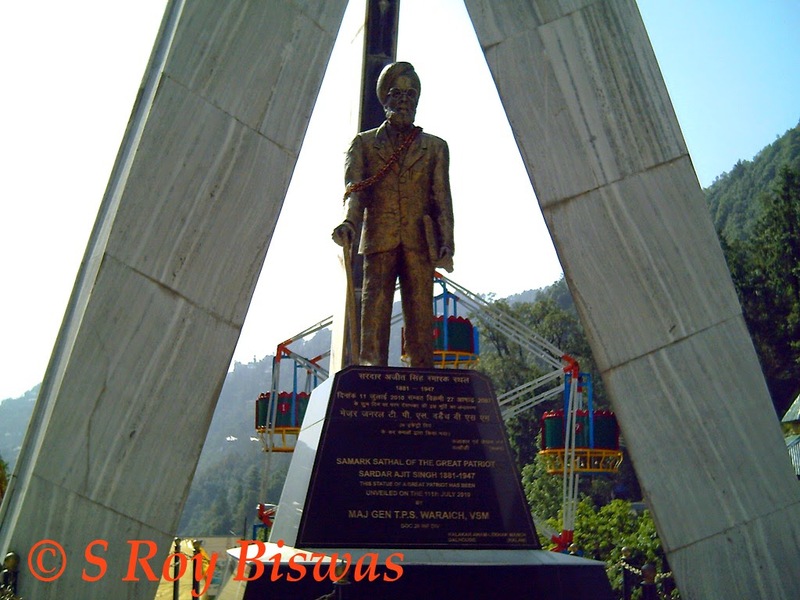 On the main road just across ‘Punjpullah’ stands a memorial erected in honor of Sardar Ajit Singh, brother of famed patriot Sardar Bhagat Singh. Adjoining the place is the ‘Subhash Baoli’ a small pond emanating from a natural spring where people do some paddle boating and eating joints and curio shops all around. This was a complete disaster for any nature lover like me, but would be an enjoyable destination for those who do not care for nature, but are merely interested in eating & merry making. Ahead of Panjpullah lies Jandhri Ghat, which houses the summer retreat of ernstwhile rulers of Chamba Kingdom, but as we were thoroughly dejected with what we had seen so far, we avoided this spot and returned back to Gandhi Chowk. My Mom & in-law decided to give Gandhi Chowk a skip and headed back to the Hotel as there was no place of park the Car due to heavy rush of traffic in Dalhousie, being a Saturday. My daughter was full of enthusiasm, as she had planned to visit the local Tibetan Market, having heard about it from some place, but her euphoria was short lived, as the local Tibetan Market was a total disaster. There were no shops selling anything ethnically or remotely associated with Tibetans, but were selling cheap China made slippers et al. Thoroughly dejected, she decided to eat some Ice-cream instead and thus, we purchased some and sat at the bus stand enjoying the Ice cream and the hustle bustle around. 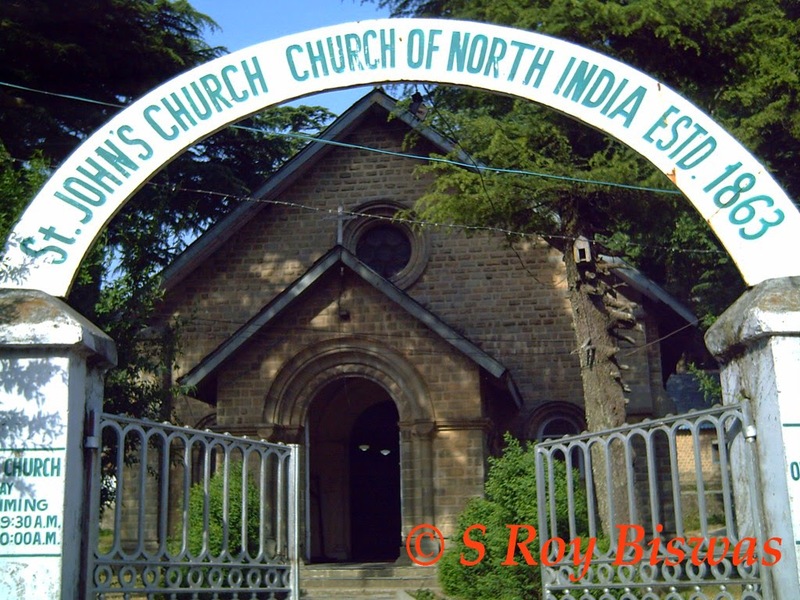 I went to the Church situated at the Gandhi Chowk known as St. John’s Church and shot a few photographs of the Church and that of the statue of Gandhiji just outside its precincts of the Church. Thereafter, we started walking towards Subhash Chowk through the ‘Garam Sadak’. Just at the juncture of Gandhi Chowk itself, there are a plethora of shops selling all kinds of trinkets and my daughter was thrilled to purchase some. We headed further along the road and found the views of natural vistas from this road were beautiful too, but this place too was plagued with the same malady that has set in the rot of Dalhousie i.e. Hotels, which can be found in all shapes and sizes akin to Shimla, growing like wild mushrooms during the rainy season, on this road as well. This road is also infested with monkeys, as they find food from the waste bins placed around by the hotels. It is a moderate walk of about two kilometers from Gandhi Chowk to Subhash Chowk along this road. 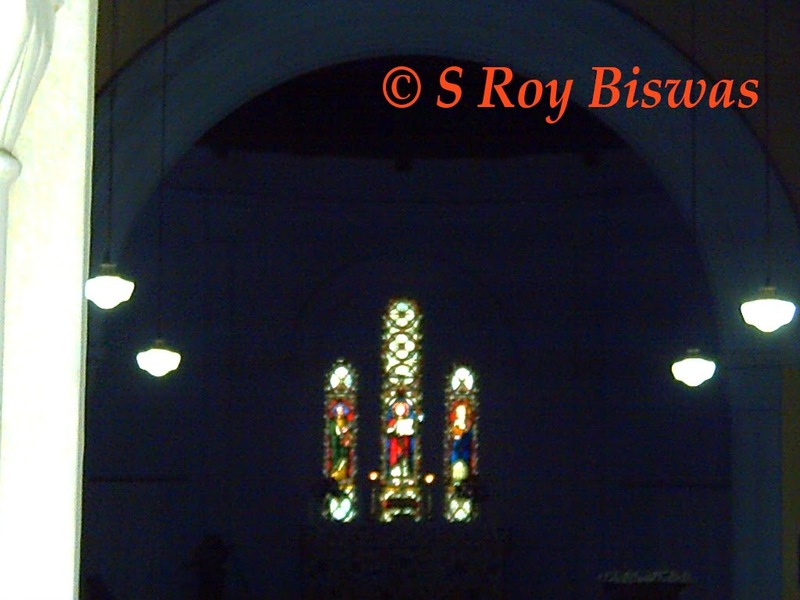 As we reached Subhash Chowk, I went ahead to photograph the famed St. Francis Church. Built in the year 1894, it still retains its beautiful glass work and intricate stone work. Having had some Coffee from the vending machine in the shop at Subhash Chowk, we walked back to the hotel and thus, ended our summer sojourn for the year, as early next morning we headed back to Pathankot via Banikhet – Nainikhud (where we shared a sumptuous lunch with a local home made recipe of sweet Mango Kadhi, which was a real delicacy) with the Mahajans before boarding train in the night from Pathankot, where the other Mahajan brother was there to provide us with some delectable home made dinner and after overnight journey back to Delhi, which had received a sharp shower of rain the previous evening and was overcast when we arrived, thus, we were saved from facing the harsh Delhi heat. I found this Blog Inspiring and most informative waiting for your next post. 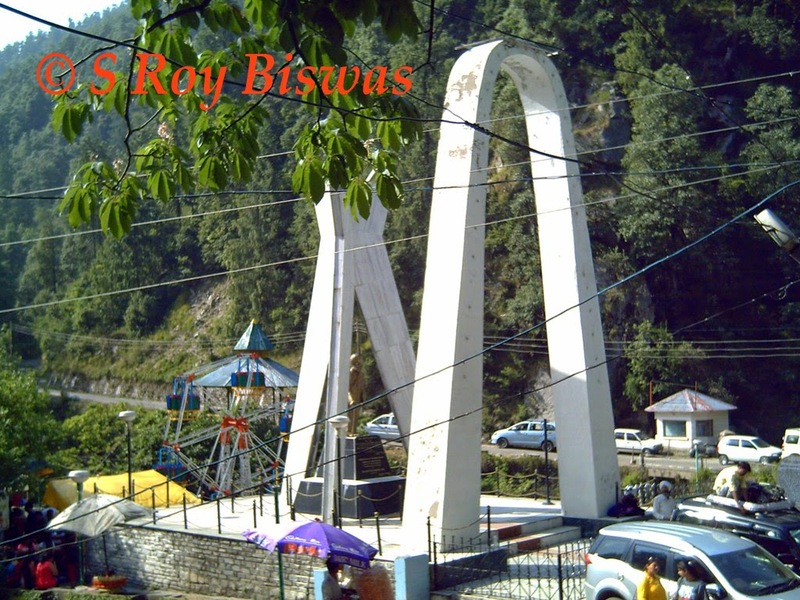 We deals in Dalhousie tour package at cheapest cost starting from Rs. 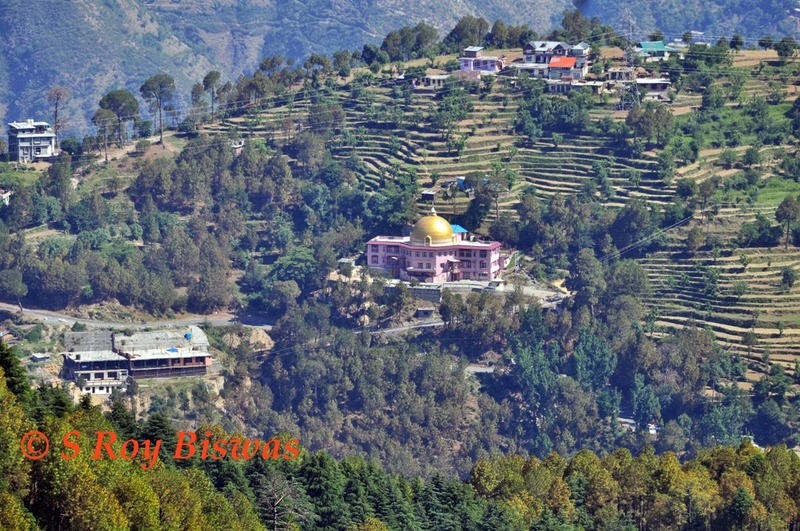 2,999. for more details Dalhousie tour package. Awesome post, Experience the highs and lows with snowfall and hill station sports with Ajinkya tours Shimla manali tours and himachal travel packages at unbelievable prices. Extremely noteworthy and extraordinary data Thanks for sharing. on the off chance that you searching for best spending inn. Shimla and Manali are the top two tourist destinations in Himachal Pradesh and the best place in India for honeymooners. Get Flat 20% Off on Delhi-Manali Volvo Booking and Kullu-Manali Packages with Travel Treat Holidays. Great post friend, you are writing about your experience. I love to read your post. Thank a lot for this unique and effective blog. Dharamshala is a very good holidaying destination, and we are Dharamshala Tourism provide customers Delhi- offering Dharamshala Volvo Booking at most affordable rates. Hello I am so delighted I found your blog which is interesting in unique way. we enjoyed the visit to Dalhousie city on our winter vacation in 2018 year end and the facilities at Hunkydory resort was good with all indoor games and best service. Thanks for sharing content and such nice information for me. 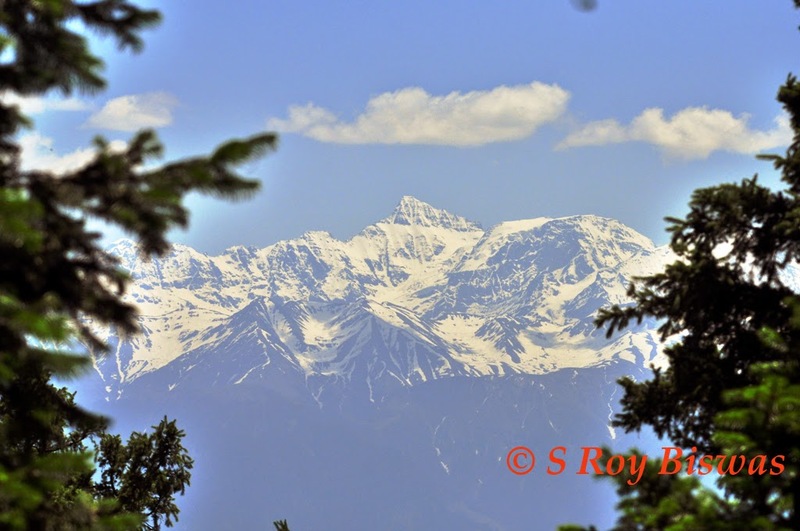 I hope you will share some more content about enchanting himachal visiting Please keep sharing!